Always the pushy one, Spencer is the first one at the dairy bar. His first day at home at 8 weeks. At 10 weeks, one ear up. 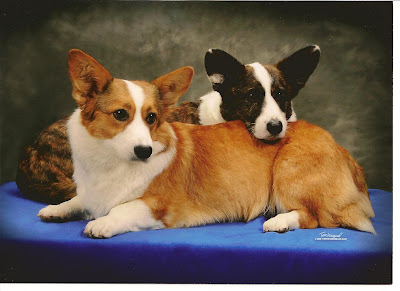 At the 2006 National Specialty, Spencer and brother Wilson celebrated their birthday running agility. 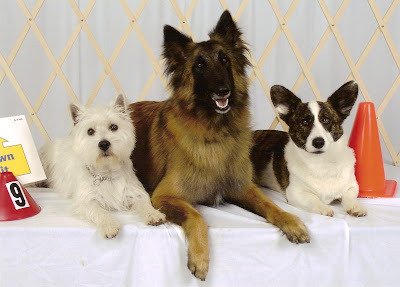 These three amigos were the first dogs in our obedience club to earn Rally titles. 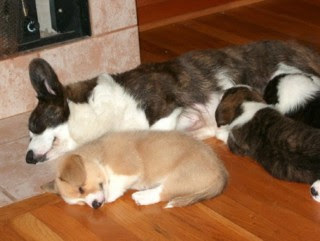 AKC began awarding Rally titles in January 2005, and these three had earned titles by February of that year. 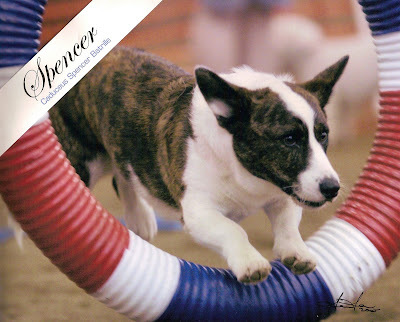 Spencer loves agility despite being born with only a partial kneecap on his left rear leg. He's a little slow, but hey - so is his handler! Believe it or not, I am restraining myself from posting a dozen more pictures. Happy Birthday, sweet boy! Happy B-day, Spencer. Get your mom to bake you a turkey cake. More, more, more. I love looking at pictures. Happy barkday, Spencer. The pictures are great - you've been a handsome boy since the beginning!